LAS VEGAS - Indianapolis Motor Speedway showed NASCAR this week what the sport's future could and should be. Fans want racing. Give them back-to-back events. Don't waste time with practice or qualifying. Set the lineup based on points and go. "I think that's the kind of open-mindedness that we need to see more of in NASCAR, honestly," Denny Hamlin told NBC Sports on Thursday of the idea. "I know that I've been in some meetings with TV partners and NASCAR trying to work on weekday races, especially during the summer. Hopefully it's on the horizon, sooner than later." Such a schedule could work for one race, maybe two a season. This isn't about making the entire schedule one-day shows, but the approach would compress the schedule. That, along with limiting most tracks to one Cup event per season, could put the season finale in September instead of November. Kevin Harvick, who has talked often about the need for bold ideas with scheduling, told NBC Sports that the key to such a one-day schedule is that "you have to protect the integrity of the racing." 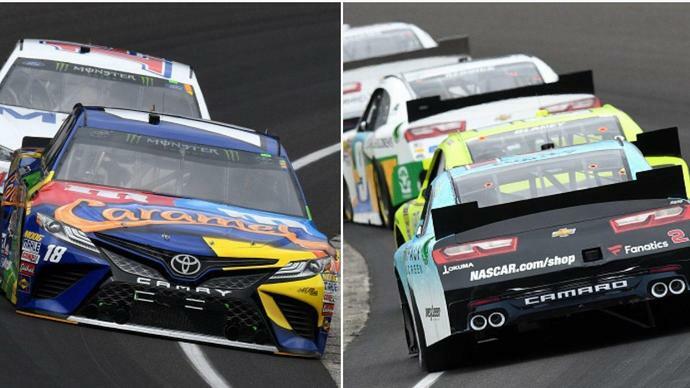 As NASCAR looks to race on a weeknight, limit how many days teams are at the track and alter the length of the schedule, the overriding question must be what's best for the sport. In some cases, track operators might lose out to what's best for the sport. In other cases, maybe it's the drivers or teams. To not do anything is the wrong approach. Frankly, that's not a tactic NASCAR is taking, but words eventually need to be turned into actions. He notes that the most talked about race this season is one that hasn't taken place yet. "That really is something that everybody sees as unique," Harvicksaid. "We need more unique events. You need a story before the story happens." "Why shouldn't Darlington have a playoff race once in a while?" Harvick said. "Why shouldn't Bristol have a playoff race once in a while? Why is the championship race in Homestead every year? That's for us? I don't think so. "I think it would be better to rotate (the title race) around. I think coming to Vegas for the first race of the playoffs is great. Not that Chicago was a bad spot to start it (but) starting there every year gets stale. You've got to keep it fresh." "I think the way the world is today and … the ask of the fans, the expense of things, it's a valid option," seven-time Cup champion Jimmie Johnson said of the notion. "When you look back to the late '90s the way fans consumed television and their avid love of our sport and the love of the automobile, all of that, they'd want a seven-day festival for a race. "It's just times have changed. I don't think it's a bad idea at all. Times have changed." The 2019 schedule is set but 2020 can be a time for the sport to move forward. In the last nine races, Martin Truex Jr.'s pit crew has been penalized for three tire violations, more than any other team. Next is Austin Dillon's pit crew, which has been called for two such violations in that time. It's one thing for drivers to be engaged during the season but married - and during the playoffs? Kyle Larson and fiancee Katelyn Sweet are scheduled to marry Sept. 26 - four days before the inaugural Cup race at the Charlotte Roval, which will determine what four drivers will be eliminated from the playoffs. "Kaitlyn wants a warm wedding, and I race during the off-season so I didn't want to mess up my offseason plans," Larson said Thursday. "It happened to work out that we can do it right before the Roval there. So, it's coming fast and I am ready to get it done." "I have kind of let her handle most of (the planning) and I will be there for the rehearsal dinner, the wedding and hopefully we don't practice on Thursday. Because that will be rough." Cup teams will not practice that Thursday so Larson will be OK.
Jamie McMurray, who has been hush about his future with Chip Ganassi Racing, won the final four Xfinity races there. Rockingham used to hold the pit crew competition. Drivers left from the backstretch pits and come down the frontstretch pit road for their stop. While they waited for the event to begin, they hung out along the backstretch pits. "My memory of Rockingham is sitting on the backstretch (pit wall)," McMurray said. "I was sitting back there and Mark Martin, who had won I don't know how many races at Rockingham (two Cup and 11 Xfinity races in his career). Mark is notorious for never giving himself credit and telling you how great you are. I remember Mark going: "You're the guy now, you're the man. I wish I could have done that.' Like yeah, right, this is Mark Martin. Hendrick Motorsports has won at least one race on a 1.5-mile track 24 consecutive seasons. That streak is in jeopardy this year. Hendrick's only win this season came at on the road course at Watkins Glen with Chase Elliott.